GP is used to match guilds in territory wars, match players in arena shards, and now matches players through the grand arena. But GP is a misnomer and should be adjusted. I have been playing since its release. I found the game by accident because my son was just beginning to get into SW, and I was looking around the app store for SW content. I was hooked from the first battle. I remember the days when Jedi Knight Anakin and Ahsoka were the best toons to use in the arena. Fast forward a couple years and I have a healthy 3.2m GP. Awesome, right? No, because more than half of my team is useless against the new toons. My G11 Jedi from 2 years ago get obliterated by everyone ranked 300 or higher in the arena and cannot get passed the 5th wave in TBs. The point is that when matched, especially in the grand arena, my competition (of a similar GP) has a much deeper squad because that player's GP is comprised mostly of obsolete toons. I am in no way complaining (because if I was, it would be a multi page rant regarding the lack of a Jedi Luke, Han/Chewy Millenium Falcon, and a Luke X-wing), just trying to get my point across. I love the game too much. I think GP should be weighted towards newer characters or a significant evolution of the original characters needs to occur. Old hats, I'm wondering what you think. Newer players need to get off my **** digital lawn. If you didn't keep up and farm the new toons and new and stronger jedi, it was your own choice. Players, who kept up and kept farming may have developed a stronger roster (for GA at least). They have an advantage of course. Bastilla is the only relatively new toon in the standard zBastilla (non-Revan) jedi team. All other jedi in that team have been in the game for more than a year. ok, I think I did not explain well enough. I used the jedi as an example because I think about my squad in terms of teams. Like a team with strong synergy, think Phoenix, can hold up relatively well against stronger squads. A team of Traya, Sion, etc. at G9-G10 could destroy a team of G12 original toons. The newer ones are obviously stronger, have better synergy, and have new abilities. I am certainly not complaining about Traya or any new people. I just think GP needs to be weighted towards newer characters. I don't want to argue that it is unfair, because your point re: farming is somewhat correct. I did not farm the new people like I others but that comes down to me not realizing how powerful they were and focusing instead on what was currently trendy (i.e. Fives, Rex, Phasma, etc.). Hope I clarified what I meant. GP is used to match guilds in territory wars, match players in arena shards, and now matches players through the grand arena. GP has nothing to do with arena shards, as I'm sure you're aware. It's based on when you become eligible for arena, then dumps players in, until the preset qty is filled. Then the next one, and so on. While long-term players have those older characters, some at absurdly high levels of gear, they (we) reaped the rewards that went with having them. But yes, many are no longer viable for the tasks at hand. And while the talk of reworks used to fill the forums, with complaints/observations, it appears that reworking existing characters isn't really ever going to be in the scope of many. Perhaps a couple iconic characters yes (Mace), but I don't see them reworking Farmboy Luke into something that will rival (in value to a squad) a newer released character, like Enfys Nest. The simple matter is, that characters outgrow their dominant value in the game over time, and become utility pieces on the board, while what is released, can change the face of power overnight. One small example, is that in less than 12 hours since C3PO was released, there is evidence that he can fit into teams, and beat anyone. solid points... I will definitely rethink my approach. I considered how hard it would be to rework toons, but I honestly have no idea what the backend issues would be. Increasing GP on new characters is just penalizing new characters not all of which are particularly awesome. CG wants people to acquire (preferably with money) new characters so there is no way they will implement this. I would love to see them implement a method for decommissioning a character that is no longer used. For example you could break down gear back to salvage for a small loss. However I also do not see this happening since this is contradictory to their plan for the game. I think the better method for making GP more fair is to just increase the amount of GP you get from the g11 and g12 gear. A decent g12 can take out a whole squad of g8 characters despite the fact the the squad probably has double the GP. 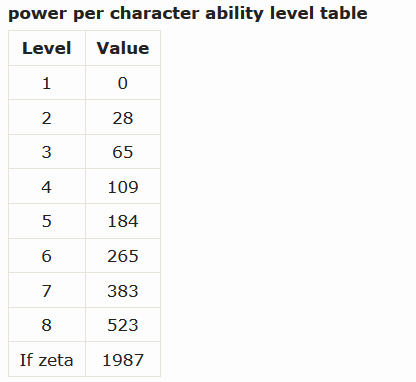 If each piece of g12 gear had its GP value increased 10x you would have a lot fewer imbalances in GA. This would benefit the people with very narrow characters focus by giving them more GP in TB but it will also help separate them from people who have a very broad character base which will make the GA matchups more balanced. I'd like the option of benching some of my roster in the Preview phase. Anyone benched doesn't count when matching, but of course you're unable to use them in offense or defense for the duration. Benching a pilot means you can't use their ship either. It would help reduce the old chaff in the roster, and also give the Preview phase a reason to exist for 24h. As a 3 year player, I've got a reasonable amount of obsolete characters that I'd never use in a GA match. 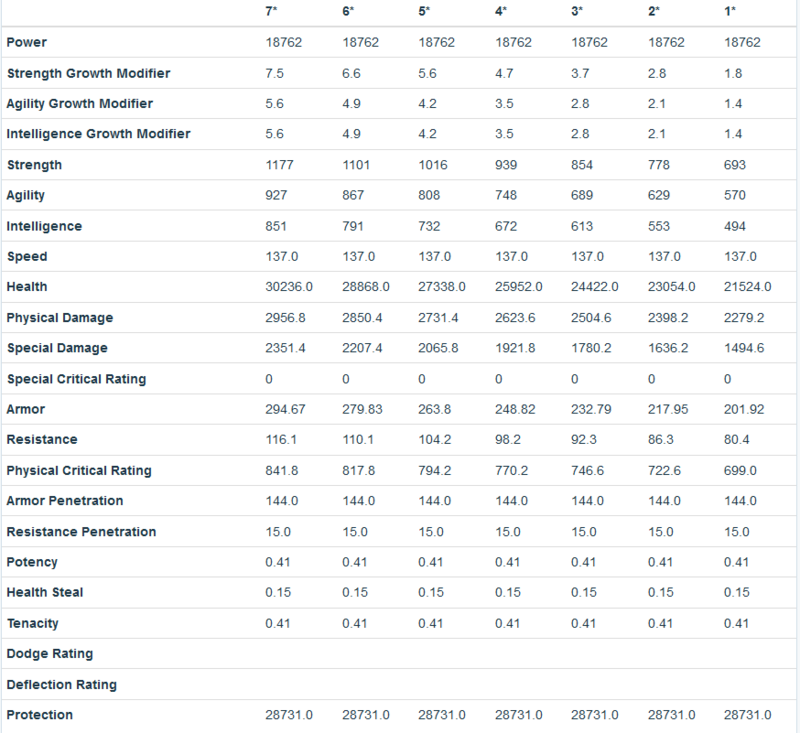 I also think that they need some sort of metascore when matching instead of just raw GP which takes into account leader zetas, trims down ship GP, and overall unit usability. But perhaps they already do something like that. I love the decommissioning idea. I'd love to decommision cup and jedi guardian fir shard shop currency. It would also be a good twist if after a player decommissioned a toon (relocks them and converts all shards to shard shop currency), they could be needed for something in the future. Like imagine you decommissioned jawas and then they were needed for a legendary. Just imagine the whinning. Benching could lead to some seriously broken stuff. Let's say youre at 3,5m and have revan unlocked and all other stuff unlocked. Now you bench everything beside a few top teams and youre suddenly sub 1m. No normal 1m player will have any chance. I would rather them go back and do some broad sweeps of reworks on characters that most of us older players have (like qgj, clones, etc that were once on par). The game is always changing, always evolving, and a side effect of that is older toons can't even compare to most of the year 2&3 characters. Most don't even have unique abilities or any synergy with their group. Some were reworked to be useful again, so I'm hopeful it will happen one day for the others..
As opposed to someone who has the gear but just never used it. in the current system ? Gp doesn’t match players in arena shards but ahead with next points. - I'm strictly against assessing the value of toons. A toon is a toon regardless of how much power creep has happened or if one is excelling and the other one is faulty by design. This is where the player choice steps in. I'm not faulting anyone for starting later to have better toons geared or having bought toons ahead of others. However their differences in this part should absolutely be crucial for their PvP modes success just as arena is from day 1. - Quickly looking through my roster an unmodded g7 85 tusken is worth 10.7k GP while my greatest GP toon Thrawn at g12.5, 6e mods, 2 zetas is worth 24k gp. - No wonder someone did their homework. I was wrong to think it was widespread steps. This is exactly an exponential function which can be extrapolated to higher levels etc. one is whether the GP needs to factor in a toons value (in terms of what objective scale? a toons solitary value based on kit design, interactions, team make ups etc. two is how the current factors in GP calculation can be made better. Maybe they don’t exist after all. Maybe there is a difference between keeping a roster lean and pick and choose the exact toons you want to include in matchmaking. Maybe pick and choose is one of the worst conceivable idea about ga matchmaking. Of course that’s just my opinion. 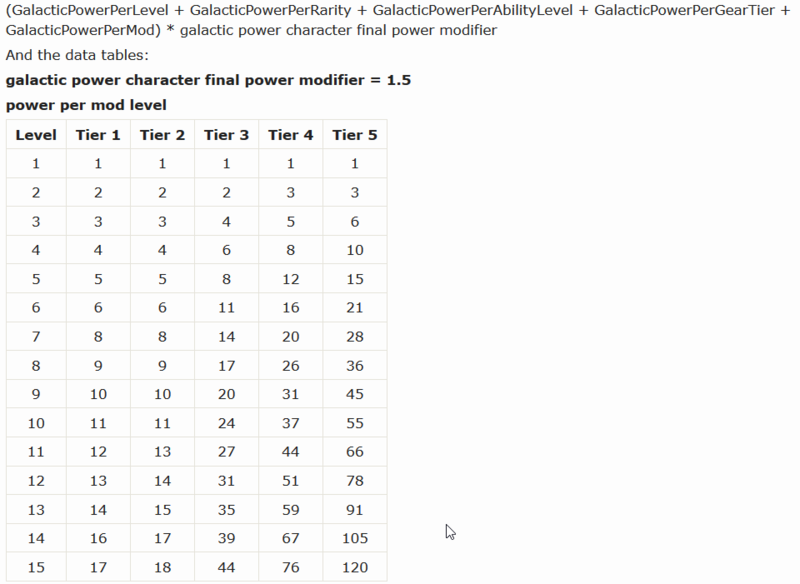 Assign invisible modifiers to each character’s GP, then use that cumulative instead of GP as the main matchmaking metric. So, create an invisible secondary “weighted” GP used only for matchmaking. 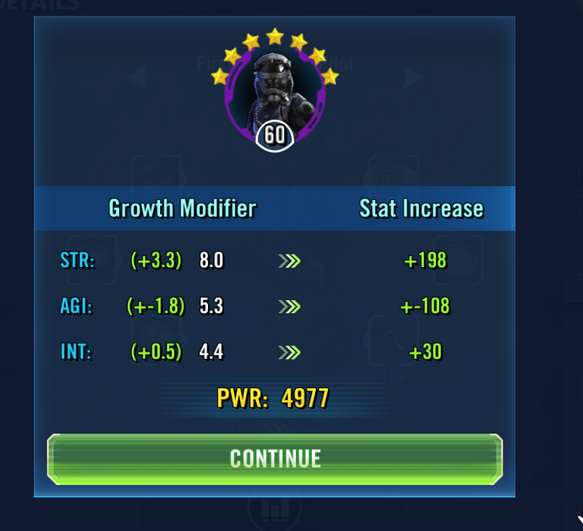 But Ugnaught doesn’t help you in GA whatsoever, therefore we assign this character a GP modifier of 0.1 or maybe even 0.0, because he is truly useless. Meanwhile, on the other end of the spectrum, characters that are incredibly difficult to beat, require massive investments, and generally make the difference between the good players and the bad players, would have much higher modifiers. Game changers like Jedi Knight Revan and Darth Traya may have modifiers of 4.0 or even higher. Fluff based inventories with lots of bad characters starred and leveled will have this taken into consideration with the weighted GP, and lifelong meta-chasers with every OP team that’s ever been will suddenly find themselves facing likeminded individuals in GA rather than taking a leisurely walk in the park over some dudes with 70 characters at Gear 8. Posted this in the mega thread because I figured a topic of its own would just get merged. Thought this thread was headed in this direction and may like the idea. Who will decide what multiplier to apply to each character ? Cg ? How will they do that ? Based on what ? You’ll need to recalculate every multiplier everytime a new toon comes out or is reworked since those multipliers are all related. How does it interact with other game modes ? Are good pve toons worth nothing ? How is TB going to go ? Meta chasers chase meta to beat easily those who don’t, and have a chance at beating those who also do, why do you want to take that advantage away from them ? How do you adjust rewards based on roster strenght ? If you are going to match stronger players against each other and weaker players against each other you need to make sure that weaker players get less rewards winning than stronger get loosing. I think you think this is much more complicated than it really is... characters can largely be broken down intro groups of useless, useable, meta, and semi-meta. It’s not too difficult to tell which is which, especially for a company with as much data as CG has. It doesn’t interact with other game modes. Because it’s a PvP only modifier, PvE performance is irrelevant. You won’t need to recalculate EVERY modifier, that’s a gross overstatement. Usually teams beat one another in a Rock Paper Scissors manner. If one meta snuffs another out, it will probably only affect the useage of one or two teams. What do you mean how is TB going to go? It doesn’t replace Galactic Power. We don’t even get to see these numbers. Wait what do you mean by « it’s a pvp only modifier » ? You mean that people who farmed a lot of fluff to perform better in tb and have more tools in every pve event will get all the benefit for 0 cost while all the pvp focused players earned is the right to face tougher competition ? And i personally believe that you are making it way simpler that it actually is. Character’s strenght is actually very hard to evaluate individually in this game. zFinn g12 doesn’t have the same impact on your roster wether you have 0 other resistance toon or a full team. Palpatine’s rating would not have been the same in april than now. Some characters are not considered « meta » and yet quite effective. Try to pit together a tier list and post it on the forum, see how it goes. Yeah Traya and Revan are obvious A tier while Ugnaught is obvious D or F or V or whatever the number of tiers you want to use. Everything between that is heavily opinion-based. And finally, of course you only heard about « horrible matchups » (whether they are fair or not is up to debate), since people who had nothing complain about...didn’t complain. And again, then you have to give stronger players better rewards, which is not a straightforward thing to do either. Players place defense like normal. However, once a character is placed on defense, it is unavailable in future rounds of GA. Unavailable characters are reset once that player loses a GA round. So if you win the first and the second round of GA, you are probably digging a bit deeper into your roster than normal. This could be a fun way of leveling the playing field with all of the breadth vs. depth of rosters out there. I actually suggested something like this in the megathead way earlier. Basically I proposed that they lower the amount of nodes each match, but only allow teams to be used once across the whole 3 day event. That way you can still use all the meta teams, but you'd have to use much more strategy in where and when to place on defense or use them on offense. And less frequently used teams like ewoks may prove to be the difference of who wins in the end. I'll post how current GP calculations are made to bring it forth. Didn't include ships yet. Will post it if debating this garners interest. I just checked back in on this, thinking I was the only person thinking about this topic. You guys gave a lot of great opinions and some excellent food for thought. Some of the ideas I hadn't even considered. So more sleepless nights thinking about SW are ahead of me. I added things up, assumed the no's for gear are for a slot. You can note down your stat bumps, but I bet this should be somewhere either on the forum or reddit. 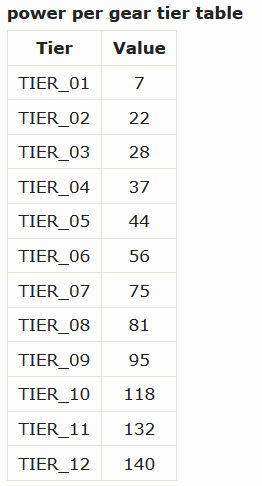 A quick look at the gear table shows tiers are not getting their due value in terms of...anything besides just getting multiplied by an arbitrary number. I finally managed to put my finger on the what's wrong with the current approach of GP calculation. 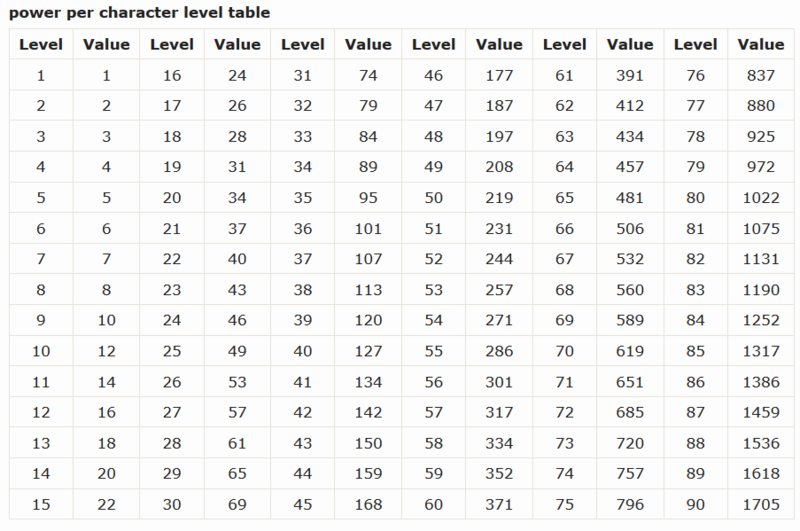 Level, gear, stars are all either multiplicative or additive to the initial stats of a toon. But GP considers them as completely seperate entities and is only additive. In terms of stats levels and stars scale them together. It proved more difficult than I thought to come use stats and multipliers as the basis since level adds in a single value for a toon but is different for every toon. 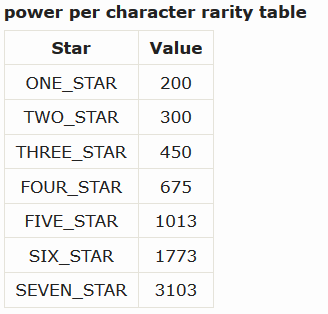 Stars modify most of the things as a multiplier but is also different for all toons. Gear is all over the place in what it modifies. At least it doesn't scale. TW matching is more complicated and has changed a couple of times and apparently does try and balance out meta toons. Still lots of complaints. I think they should maybe try and split player and ship GP for GA but otherwise don't bother. There are some practical problems with this as well and a simple example. Let us suppose the Universe consists of two guilds with 48 players each, both join TW and all members join GA.
Possible TW match ups = 1. Possible GA match ups of 8 people in each = 132.6 billion. Add guilds and assume they all enter TW and GA the multiple difference gets insane. It HAS to be relatively quick and simple or hell would freeze over before matches were made. I am not sure but they may be trying to avoid repeat matches as well. They could have a hidden "adjusted" GP saved I guess and use that instead but on the fly trying to do that and match in anything approaching real time wouldn't work unless it is close to just sorted GP and adjust re-matches (again, if they even do that). Yeah that's why I think GP calculation should be adjusted and still be used as the matchmaking parameter. Adjusting how GP is calculated is mute on the difficulty of matchmaking as it will still the same. Yeah would be, it would still need to be relatively simple and just single stored number for each person though, digging into skills, stars vs mods etc.... I was just trying to give an idea in the difference in complexity. Yeah single number ofc. I'm against weighting numerous factors in matchmaking. Fair doesn't mean equal as in the opponents have too similar rosters, just that factors that go into their GP is fairly assessed relative to eachother and within each's tiers.